Sunday brought a wintry blast of snow and rain to the area, and the city of Chicago came painfully close to making history, but fell just short. After Sunday’s weather system moved through the area, the National Weather Service has confirmed that O’Hare International Airport, which sets the standard for the city of Chicago, received 5.3 inches of snow thanks to the unseasonable storm that struck the area. That total is remarkable, as it is the most snow the city of Chicago has ever received on April 14. Unfortunately, according to a chart released by the service on Sunday, the area came just short of achieving something even cooler. The NWS released the chart laying out the most snow the city of Chicago has ever received on, or after, April 14 in the 135 years of record-keeping at the service. 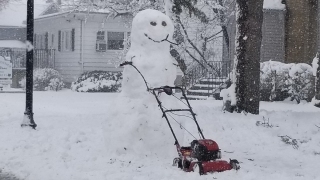 Sunday’s total of 5.3 inches comes just 0.1 inches short of tying the record for single-day snowfall, set on April 16, 1961, when the city received 5.4 inches. Even still, Sunday’s snowfall was nothing to sneeze at. It is only the third time in history that the city of Chicago has gotten three or more inches of snow this late in the season, and is the first time that mark has been reached since April 23, 1967. In addition to Chicago, we're keeping track of all the snowfall totals from around the area here. News breaks at inconvenient times. Download one of the NBCChicago mobile apps and have the news come to you. Watch live streaming newscasts, receive critical push notifications on the go and stay in touch with your city around the clock.